Last Friday, our client and friends at VisitPittsburgh hosted their annual Pittsburgh social media event: Tweet, Like & Be Social. This is an event featuring the best in the ‘Burgh on how to engage the community and customers using social media – and I was able to snag a front-row seat. A few of the main speakers included Margee Kerr and Scott Simmons from Scarehouse, Alex Moser, Director of Marketing for Seven Springs & Hidden Valley Resort and Anthony Vennare from Fittsburgh. The following rundown makes clear why these brands are considered local leaders in the industry. “25% of users turn away from a YouTube video if the video doesn’t start within 5 seconds” – a stat keynote speaker, Margee Kerr from Scarehouse opened with on Friday. With a PhD in sociology, Kerr began by offering a bite of basic human behavior on why this may be. We learned humans have evolved to be drawn to novel experiences. We seek out and pay attention to shiny, interesting, startling and instantaneous things – it’s how we survived. Sure, back then it meant discovering a wolf nearby, but today it’s how we discover content. Scarehouse publishes video and images on a daily basis. These videos aren’t just sneak peaks. They use videos to teach people how to do things, discuss their expertise, offer behind the scenes footage, meet the team and more. The clip below for example features a look behind the mask of one of Scarehouse’s popular actresses. Customers want to know the people who make up the brand on a personal level. These tactics present Scarehouse as a company of people who know people, not just a brand trying to sell tickets. Scarehouse is also known for their instantaneous social media posts that connect people with the brand all-year-round. Their iconic bunny figure shows up a lot in such material. 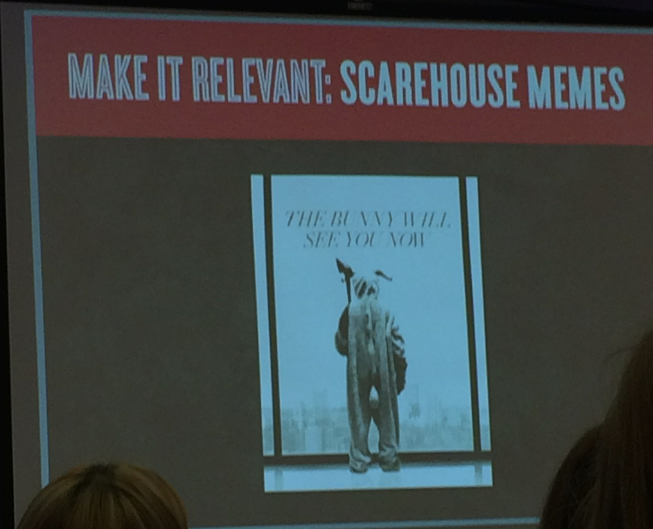 You can see this in the picture below – when Fifty Shades of Grey came out, Scarehouse jumped on the opportunity to sneak their brand in with the trend. Alex Moser, Director of Marketing for Seven Springs and Hidden Valley Resort zoomed in on the importance of branded video today. Moser opens with “transparency is paramount and video can help with that.” His marketing team pushes out branded video and photography daily, especially in the winter, to connect with their audience. In the winter, their audience wants to know one major question each day, how much snow is there? Instead of posting text updates, Moser’s team finds creative ways to show the conditions of their slopes like the one below. These videos are snackable and sharable, making the audience want to come back for more and buy tickets when they’re ready – creating not only brand awareness, but also brand loyalty. Brothers Anthony and Joe Vennare combined a passion for Pittsburgh with extensive knowledge of health and fitness and how to reach people. Their product is called Fittsburgh – launched in May of 2014. 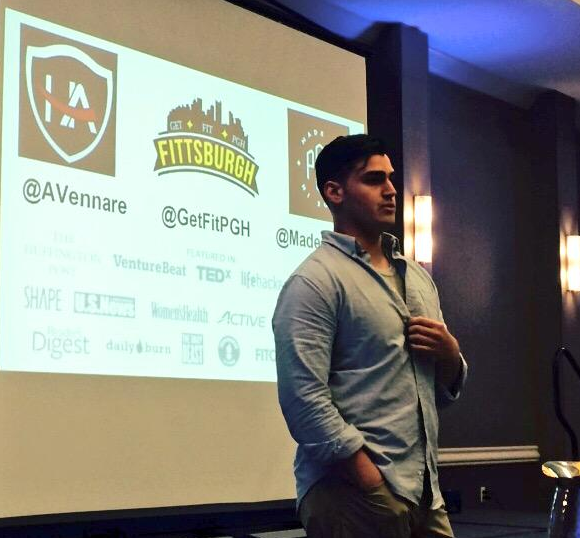 Now with thousands of followers, customers and subscribers, Anthony gave the #SoMePgh audience a look into his marketing success. VisitPittsburgh brought us back full circle at the end of the event with a reminder to focus on your goals and your audience. Want to join in on the conversation? To share your social media marketing tips or for even more highlights from Visit Pittsburgh’s event, search with the hashtag #SoMePgh.